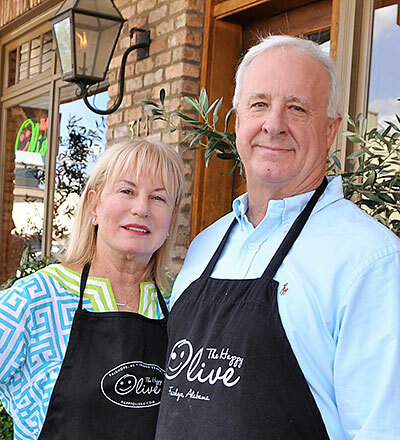 The vision for the Happy Olive began more than ten years ago… with a visit to Italy that never ended. Our daughter Shayna was traveling while a teacher at the University of Georgia, and fell in love with an Italian who would change her life and ours. Marriage to Paolo in a mountaintop castle near Chivasso, Italy merged our families, and launched our own love affair with the country, its culture and of course… fabulous food! The Fasolos live on their own olive orchard and vineyard nestled in the hillside of the Veneto Region, some of Italy’s most celebrated hillsides. Our first experience in the centuries-old tradition of harvest was magical – with a deep appreciation of not only Shayna’s wonderful new family but their inspiring culture of healthy diet and lifestyle. What we’ve labeled the Mediterranean Diet is simply second nature to Italians: a regime of non-processed foods, fruit, nuts, berries and olive oils. Family is the center of Italian culture, and time with loved ones around the table is a cherished experience. Never rushed in the American style, but full of laughter that lingers over meals with one celebrated constant – Olive Oil! Natural aficionados of this liquid green oil, the Italians deeply realize its remarkable health benefits. All we learned during these visits over the years inspired a desire to bring our new passion for healthy eating home to share with friends and neighbors. Our first and favorite Happy Olive oils came from the Fasolo vineyards. But with their limited supply, we knew we’d have to search other regions of the world to offer the quality and variety we envisioned. Careful choices by hemisphere according to seasonal harvest ensure a premium “crush date” – far from the typical store-bought oils that may sit on a warehouse shelf for months. More travels followed to Modena, Italy to research balsamic vinegars that best complement each oil. Infused balsamics have become a passion allowing us to add seasonal favorites like South Alabama’s spring strawberries and blueberries, along with special requests like chipotle or lavender. In 2016, yet another trip inspired the latest addition to the Happy Olive culinary offerings. Sampling the incomparable fresh mustards from the Dijon region of France, we were hooked and quickly determined to try mustard-making ourselves. Over the following year, Richard studied with the masters of mustard from Maille in Paris and New York to earn his “sommelier mustard maker” rating. 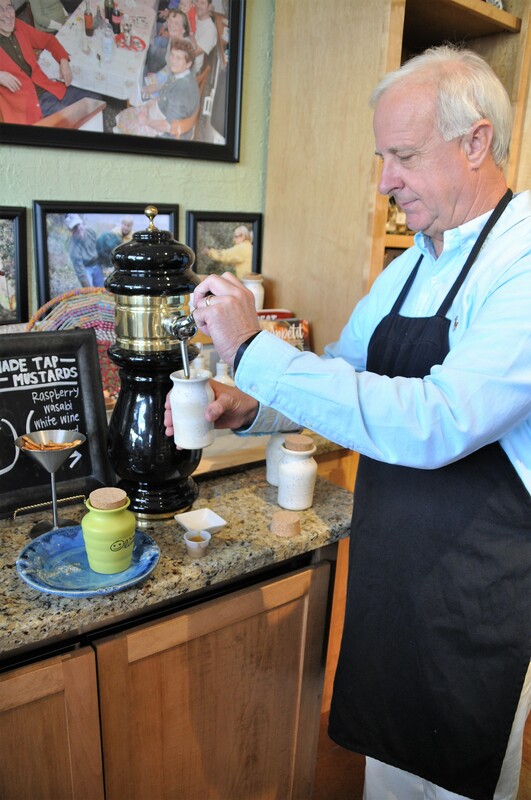 Custom mustard taps came next, to offer our small-batch gourmet blends poured right at the store. What’s next for us? We can’t wait to get back to Chivasso, to join in the harvest with the next generation of Fasolo oil harvesters – our grandchildren Carolina and Jack!